When making any recipe that features apples, it is always best to use a combination of different apple varieties. Why? Using several different types of apple will make the apple flavor deeper, more complex in the final product. The best example of this is apple pie. Read just about any blue ribbon apple pie recipe and you'll see that at least two varieties of apples are used. For today's Cinnamon Apple Twist Bread, I used Jonagold and Northern Spy apples, two varieties of apple which hold up very well to the baking process. Okay. Let's begin! The dough for this recipe can be made totally by hand, in your stand mixer or in a bread machine. This week, I chose to use my Breadman bread machine. A bread machine is a baking tool which allows you to mix, knead and bake a loaf of bread in just one machine. There are numerous different cycles programmed into the machine's control panel, including a dough cycle. The dough cycle will allow you to insert the dough ingredients into the pan and walk away. The bread machine will mix the ingredients, knead the dough and provide a warm, draft-free environment for the dough to rise. An hour and half later, my dough is ready for shaping. While the dough is going through the first rise, you can make the cinnamon apple filling. Since apples are naturally juicy, you will need to add a thickening agent to the filling so that it won't make the dough mushy or run out of the finished bread. KAF's recipe for the filling for this bread calls for either flour or Instant Clearjel as a thickener. Clearjel is a product sold by King Arthur Flour which thickens pie filling so that it won't ooze out of the crust when the pie is cut. The filling for this bread includes grated fresh apple, sugar, Clearjel (or flour), cinnamon and a bit of lemon juice. Lemon juice will keep the apples from turning brown. A food processor makes quick work of grating the apples. Put all of the filling ingredients in a bowl and mix together thoroughly. Set the filling aside until the dough is ready for shaping. Once the dough has completed the first rise, it's time to shape the loaves. The dough is divided in half and each half is smoothed out in a 10 x 12 inch rectangle. Spread on half of the prepared cinnamon apple filling then roll the dough as tightly as you can, starting on the long edge of the dough. Be sure to leave about 1/2 inch border around the edge of the dough so that you will be able to seal the loaf after rolling it. Place the rolled loaves on parchment lined baking sheets. Here comes the twisting part. This is a very simple shaping technique which results in MAJOR wow factor in the final loaf. Using a serrated bread knife, cut each loaf in half lengthwise. Keeping the halves side by side, lift the halves over each other to twist them together. Pinch the ends together to seal each loaf. Beautiful! Now the loaves need to be covered and left to rise a second time until they are puffy. Be sure to use greased plastic wrap or a large proof cover if you have one to cover the loaves. Bake the breads in a 350 degree oven for 30 to 35 minutes until they are golden. Your house will smell wonderful as the breads bake, all cinnamony and appley. Here are the baked loaves just out of the oven. Behold the major wow factor! Aren't they gorgeous?? Take a good whiff ... mmmm! After the breads have cooled for about an hour, you can drizzle on a simple glaze, made with confectioner's sugar, vanilla and milk or cream. Once they are glazed, the breads are ready to eat. O.M.G. Perfectly sweet, slightly gooey, this bread is amazing still slightly warm. My husband and I almost polished off an entire loaf in about 30 minutes. I had to put the knife away. I took the breads to share with my friends at the dog park the next day. They disappeared in record time. 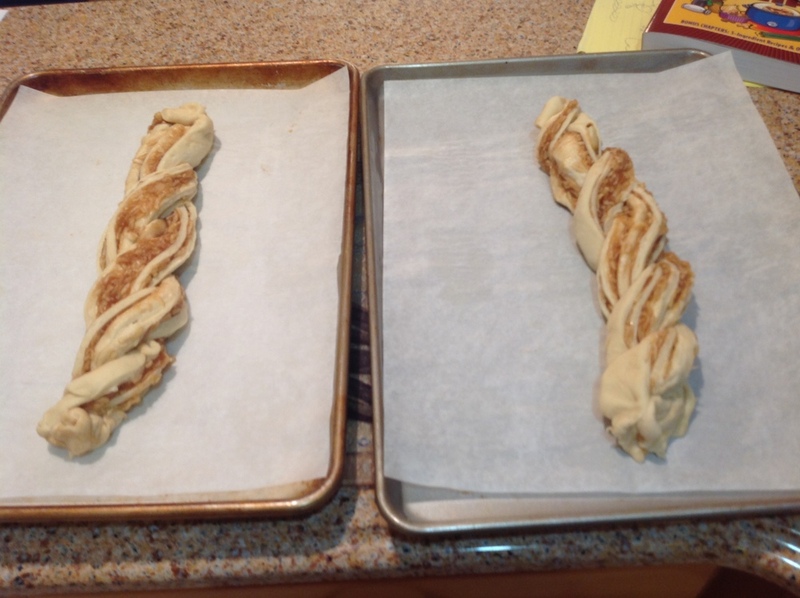 If you want to try your hand at making Cinnamon Apple Twist Breads (and seriously, you know you want to! ), you can find the recipe in Sift magazine, the autumn 2015 edition. You can also find the recipe on King Arthur Flour's web site. Until next week, dear friends, celebrate fall with some seasonal baking!